My favorite types of books are nonfiction, specifically the history of science. It’s the nature of science that so many discoveries and innovations throughout history shaped not only the eras in which they originated, but continue to shape the society of their futures. I also find it so compelling to discover the story of someone who lived and died, contributing to a scientific advance that has had an impact on us all, but whose name has been outlived by their deeds. 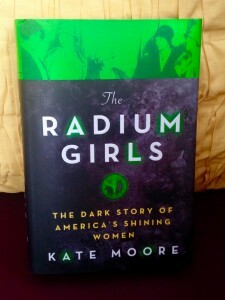 With this in mind, it is probably not surprising that The Radium Girls: The Dark Story of America’s Shining Women by Kate Moore fits squarely into my literary comfort zone, and that I loved it. Starting right after World War I, The Radium Girls chronicles the rise of radium as a wonder element, incorporated into untold numbers of beauty and household products, as well as used industrially for its ability to glow in the dark. This was an era in which a glow-in-the-dark wrist watch was an extremely sought-after item, and companies like the United States Radium Corporation and the Radium Dial Company sprung up to cash in on the radium craze. My copy of The Radium Girls. Photo by Erin Podolak. Hundreds of young women, some barely into their teens, came to work at these companies because they offered well-paying jobs at a time when families were struggling. Young women who could work would do so to help support their families in the years before they established families of their own or to provide themselves with spending money. At the time, while some scientists were just discovering that radium could be extremely dangerous, the public image of the substance was that it was beneficial and couldn’t possibly be harmful. A well-paying job with other young women in a joyful and convivial atmosphere, working with a healthful wonder substance that had the added bonus of making your clothes and hair glow-in-the-dark? It was an opportunity few women could pass up. So women flocked to the factories, spending every day sitting in a studio painting watch dials with luminescent radium paint. To paint the small numbers on the dials, the women used a technique called “lip pointing” –twirling their paint brush in their mouth between highlighting each number to make a fine point, ingesting traces of the radium paint each time they did so. Within a few years, the “dream job” bubble would burst as women started suffering from mystery illnesses: tooth decay, mouth sores that wouldn’t heal, pain in their feet, their backs, their hips, low blood cell counts, sarcomas, and even bones that simply crumbled at the touch. Ultimately, scores of women would die of these illnesses, many long before the women and their doctors were able to figure out that it was exposure to the radium that was harming them. Radium was still new enough that its negative effects were poorly understood, and illnesses like the dial-painters had never been seen before. Companies profiting from radium and the girls’ work had every interest in preserving radium’s healthful image and their own finances. The companies would go to excessive lengths to avoid taking responsibility for any of the women harmed by the radium in their studios. Moore’s book tells the story of these women, as they struggled to make sense of what could have harmed them, never dreaming it could be their employers. She notes their dramatic turns from victims to advocates as they discovered their own poisoning, fighting until the end to make sure that the companies were forced to do the right thing for their workers. “When they checked the x-ray film, days later, there was Mollie’s message from beyond the grave. She had been trying to speak for so long-now, at last, there was someone listening. Her bones made white pictures on the ebony film. Her vertebrae glowed in the vertical white lights, like a regiment of matches slowing burning into black. They looked like rows of shining dial painters walking home from work. The pictures of her skull, meanwhile, with her jawbone missing, make her mouth stretch unnaturally wide, as though she was screaming-screaming for justice through all these years.” The Radium Girls, page 194. It’s a passage that I read and re-read, and I think it showcases how Moore writes. It is captivating and hard-hitting, playing up the facts and their resonance at the same time. The book shines a light on the misdeeds at the dial painting plants in Newark and Orange, New Jersey and in Ottowa, Illinois. Having grown up in New Jersey, the story of the dial painters struck a chord with me. But the plight of the women in these cities is a story that is altogether engaging and compelling. At the time, radium sickness wasn’t even defined, but the women fought to make their illnesses recognized by the government. They went on to challenge the companies, even forcing changes to worker’s compensation rules, and saving countless lives by exposing radium for the dangerous substance we all now know it to be. The amount of deceit on the part of the companies made my blood boil with the injustice of it all. I think being a young woman, I could relate to the idea that young women would simply believe their bosses when they said they had their best interest at heart. I think that was a lesson that I learned the hard way early on in my career, that if something seems too good to be true, you have to wonder where the good fortune is coming from and question the motivations behind it. The women never considered the possibility that they were being lied to, that their very lives were worth nothing to the companies compared to their bottom line. It also gives a new (to me) perspective on corporate misdeeds, how far some people might go to earn a buck, the lies that might be told, and the people that might be harmed. The timeline of events in the book is perhaps the most damning part of the story, because it shows without a doubt how, if the companies and individuals who knew that radium was harmful had owned up to it as soon as they knew, so many lives could have been spared, so much suffering avoided. In the end, the idea that it was all only for the money, only about profits, just leaves the whole story tinged with sadness, because it does not provide a satisfying answer to the question of why, why would anyone knowingly do this to another human being. “For money” is an answer that is shockingly inadequate in the context of all that these women suffered, all that they were deprived of by these companies. The Radium Girls is a story that will stay with me for a long time. This story is a piece of science history, as the mystery of radium and what it could do was untangled. It is a piece of American history as the workers compensation laws were rewritten and laws put in place to protect workers. And it is a piece of women’s history as these girls banded together to take on powerful companies in a David and Goliath struggle to do what was right. It’s a fascinating and sobering story, and I wholeheartedly recommend it.